Earlier this month I shared a story of a potential record musky caught by Scott Berrier from Clinton Tennessee, who was fishing from the banks of Melton Hill Lake located in East Tennessee on January 20th, 2011. Scott?s decision to release his state record fish in order to preserve it inspired me to tell his story. In this blog, allow me to share catch and release techniques for these massive predators. These wonderful creatures are often found dead due to anglers not knowing or caring how to properly practice catch and release. To practice catch and release, have your tool ready beforehand and do not land the fish. Instead, reel it in next to the boat and keep it in the water using a very large and sturdy net like Frabill's "Big Kahuna". Remove the hook(s) with strong long-nose pliers. One may need to cut stubborn hooks with small bolt cutters (Knipex lever action). Muskies are resilient and survive well if handled carefully. Anyone who releases a muskie should give top priority to the fish's well being. Do not play the fish to complete exhaustion. Use heavy line and wire (avoid heavy fluorocarbon or mono) leaders so the fish can be netted as quickly as possible and to minimize the risk of leaving a lure in an escaped fish's mouth. Keep the fish in a LARGE net submersed in the water while removing the hooks. The fish will remain calmer if it is NOT brought into the boat or on land. It will also be able to continue to breath. If hook removal might injure the fish, cut the hook(s) with small bolt cutters. The imbedded portion can then be more easily removed with long-nosed pliers. You may also need a jaw-spreader at times to facilitate hook removal. Determine the length of the fish with a marked stick/PVC pipe or a tape measure. If you wish to weigh the fish, do so by attaching a scale to the net (NOT THE FISH) and later subtract the weight of the net. 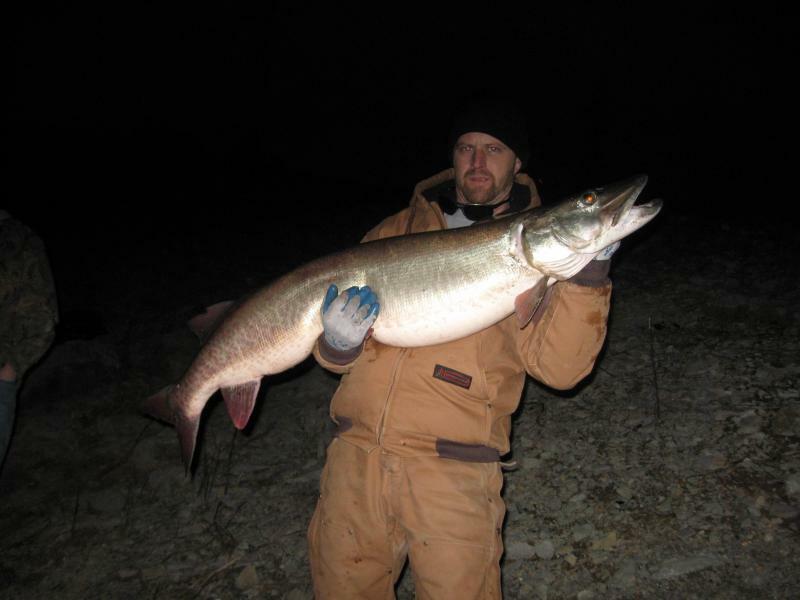 An even better method to calculate the muskies weight, is to field measure the fish?s length and girth and then use the link below to calculate weights when you get home. If you want to take a picture, do so quickly and DO NOT hold the fish vertically by the gill covers. Always support its weight horizontally to avoid possible injury to the spine and gills. When the fish is ready for release, hold it upright and horizontal in the water until it regains strength. Do not hold on to it for very long, as it will likely recover just as well on its own. Often a good, hard push will encourage the fish to recover more quickly. Here is a 48" musky that will grow no more because a careless or unknowledgeable angler, did not know how to practice safe catch and release. And Special thanks to Jim Negus of www.tnfish.org for information and pictures used in this blog.